Must have at least one (1) 5-B fire extinguisher on board; zero (0) if fixed fire extinguishing system installed. Must have at least two (2) 5-B fire extinguishers on board; one (1) if fixed fire extinguishing system installed. Must have at least three (3) 5-B fire extinguishers on board; two (2) if fixed fire extinguishing system installed. Must carry a minimum number of fire extinguishers based on their gross tonnage (a volumetric measurement). See 46 CFR 25.30-20(c) for further details. A boater may replace two (2) 5-B extinguishers with one (1) 20-B extinguisher, or replace any 5-B extinguisher with a Coast Guard approved fixed fire extinguishing system. 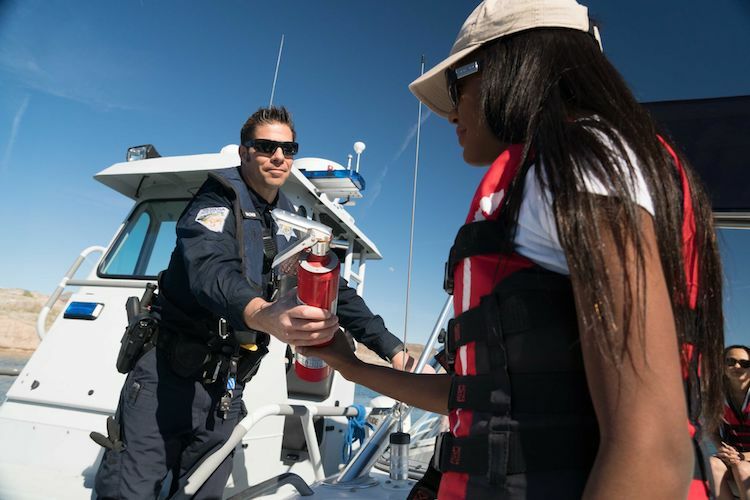 At least once a month a boater should ensure their fire extinguishers are in an accessible location on their boat, display a good operating pressure, and have been maintained to any additional manufacturer recommendations. Many boaters have never used a fire extinguisher, so it’s important to take the time to read the directions before it is needed in the event of a fire.